HomeProspective StudentsCurrent StudentsMentoring ProgramApply Here!Give Today - Thank You! 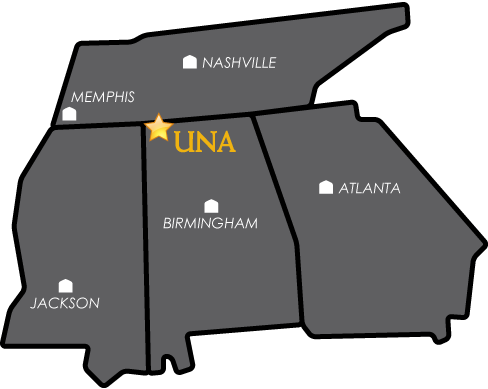 The Honors College invites you to be a part of an extraordinary opportunity at the University of North Alabama. Students, faculty, and staff are united by a shared focus on postgraduate success. Everything we do in the Honors College is designed to make postgraduate success a reality for our students … success as our students define it and on their terms. Our work is not done until our graduates succeed in whatever path they choose after college. To this end the Honors College offers a total undergraduate experience - academic, social, residential, and extracurricular. And we follow up with our students after graduation to assist in whatever way possible. We are open to all majors, backgrounds, races, nationalities, and beliefs. We seek excellence in you and ask only that you share your passion for amazing with us. Over 90% of our graduates are employed in their degree fields or are pursuing graduate work related to their majors. Apply today and be amazing with us. All domestic students admitted to the Honors College qualify for in-state tuition. Visit our Scholarship page for more information.